4 Simple ingredients are all you need for this outstanding Instant Pot Cherry Pie Moonshine. Move over apple pie moonshine, there is a new deputy in town! Sweet, easy to make and the perfect Valentine’s Day or summer inspired moonshine to serve your guests. No, you are not making illegal moonshine as you see on television, this is a safe and legal way to combine alcohols for a more enriched drink. 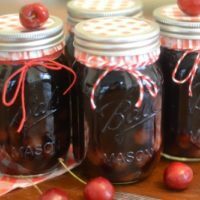 Cherry pie moonshine is a strong drink, so sip light or use it as a base for your mixed drinks. One thing I know for sure, even not being a big drinker, I still gravitate towards a few sips of this sweet creation. My Instant Pot Apple Pie Moonshine was such a big hit that I knew I needed to make Instant Pot Cherry Pie Moonshine for all of the cherry pie lovers. Now that I have made this delicious Instant Pot Cherry Pie Moonshine, I can not decide which one is my favorite. I think depending on the season will depend on what I am looking for. For winter and fall, I will probably make a lot of apple pie moonshine. 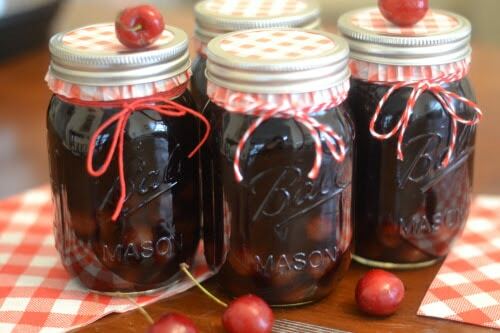 Then in the spring and summer months reach for a sweeter mix, the cherry pie moonshine. Please remember when using Grain Alcohol there is risk involved if you do not allow your moonshine to cool before pouring in the grain alcohol. Grain alcohol is highly flammable and should never be warmed. This is one area you have to really watch when dealing with making moonshine. A fun twist to the classic moonshine (legal) that you might know and love. Instant Pot cherry pie moonshine is made with a tart cherry juice and some dark cherries in heavy syrup. This is what gives this moonshine the rich and vibrant cherry flavor in every single sip. With the mix of juice, dark cherries, sugar and Everclear, you can make a homemade version of your favorite flavored moonshine. This moonshine makes an outstanding gift for someone who enjoys a drink every now and again. Just pour in a mason jar, add label and ribbon and there you have it. Don’t want to drink it straight? I don’t blame you, moonshine is STRONG! Diluting it down and using the cherry as a base is a great way to enjoy the flavors in a more mellow way. Or any other fizzy drink that has carbonation. You might even enjoy the flavors of a Coke and moonshine blend, to give it a similar taste to a hard cherry Coke. However you serve it, I am sure you all will enjoy it. This recipe is one that I will be making over and over again for family and friends. The best part of all, it doesn’t take much to make, and you can say you made your own moonshine right out of your Instant Pot! 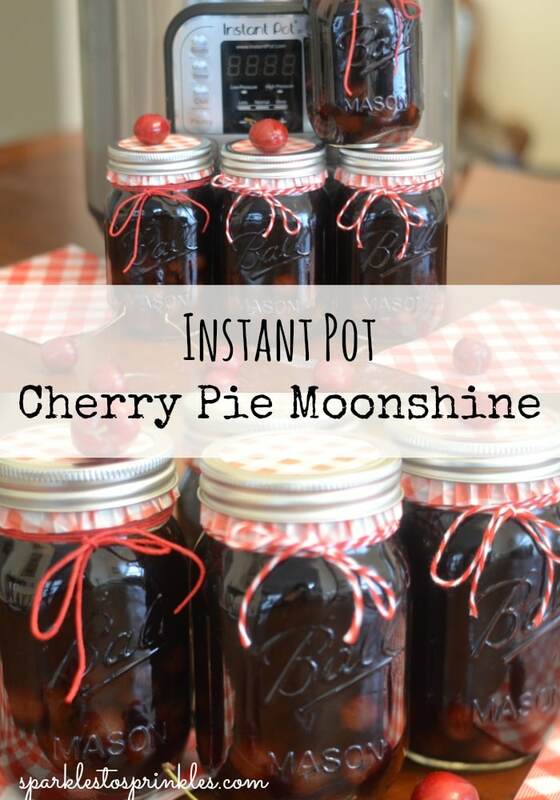 This Instant Pot Cherry Pie Moonshine is the most delicious Moonshine. It is shelf ready, no refrigeration needed then when done. Is there an expiration date, or use by ? Looks good. Have you posted any other ‘flavors” ? Did you ever post the peach moonshine recipe? I can’t find a search feature on this site. Can Vodka be used instead of the Everclear? Generally, no. Grain alchohol needs to be used because your adding it to a base which cuts the alcohol content. If you used a low alcohol content like Vodka, it will be far too watered down after mixing. It should also be 190 proof grain, if available in your area. This looks amazing! I had no idea you could use an instant pot for that. Thanks for being a part of Merry Monday!